I made roti or phulki after a very long time. I was really thrilled with this picture so I thought I'd share! 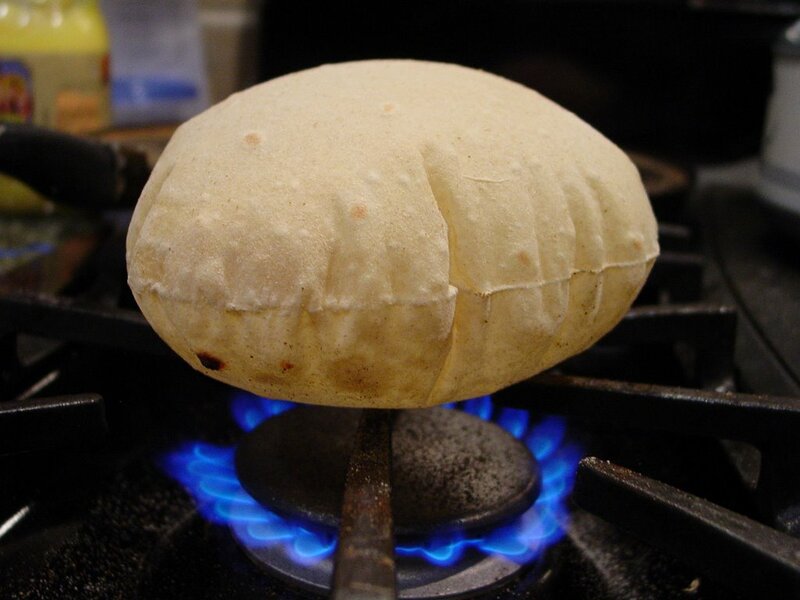 Do you have any great roti pictures? Post away, if you do! Updated: I also have another picture of a roti here. It tied for the best photo award in the Food Photo category of the South Asian Photo Contest. Oh gosh..that is a 'documentable' roti. You got good roti making skills. Wow...how did you managed to make such perfect roti? Gini, I have fun with rotis. It's the clean-up that I don't particularly enjoy. And I usually have an 8 year-old helping me with both, rolling them out and making a mess! She has her own set of tools - polpat and latna - and we end up with a lot of flour on the floor! sha, practice? :-D Been making them for years now, although not as often now. Welcome to IFR! Perfecto!!!! Perfecto !!!! I am just terribly happy just by looking at it. Could you please blog about the making of this incredible roti? Manisha, agreat picture. I get similar puffed phulkas, but by the time I try to take picture, it would get burnt. I struggled a lot and took the pictures for this Chapathis and phulkaspost. But I must admit, your picture is superb, nothing like the horrible picture I posted. The roti pic is just awesome !!! Besides, Shilpa has a great tutorial - she's linked to it in her post. So check that out! Shilpa, I have my camera ready and then just point and shoot quickly. Your tutorial is great! And there's nothing wrong with your pictures! Manju, you can do it, too. Go get one of those raised cookie cooling racks - not the stackable kind - from either the Indian store or the regular supermarket. Place it on top of a second electric coil. Roast the poli on a tava on one coil and phulao it on the rack. I did this for the first six months that we lived in an apartment. And I made roti a lot in those days cos Medha loved rotis when she was little. She still does but since her horizons have expanded, I don't have to make them on a daily basis. Inji Pennu, I feel the same way each time a roti puffs up that way. Sra, you crack me up! You are brave lady...u got time to take the snap of u'r phulka while it was puffing up so beautifully?...I've made some mediocre attempts to take the snap bt have not dared to post them!! 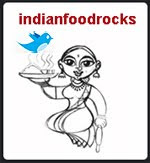 Bindu, welcome to IFR! Now that you put it that way, hmm! It kind of does look like that! Reeta, thanks! Making rotis is not that difficult. My daughter rolls them out pretty well now. She started off making all kinds of shapes - we'd try to figure out which country (map) it looked like! Welcome to IFR! wow, what roti that is! !my mom would be so proud of me if i made one like that. my rotis never come the same way they did last time. just looking at that pic makes me try again. I tried the ras malai for diwali when we had a big group over at our house. tsk,tsk... told them it took me 5 mins to get the whole thing together . Believe me something that tasted so delicious couldn't be easier. great tip for quick dessert. Uma, it's just a question of practice. And, once your rotis start puffing up, it'll come naturally to you. Rather like riding a bike! Or maybe since the season is upon us, like skiing! I'm so glad you liked the ras malai. I am one for shortcuts and why slave over a stove when you can get the same taste in minutes? ;-) A lot of folks like the milk to be slightly thickened, in which case, my quick and easy ras malai will not work for them. The milk will need to be boiled down before the rasgullas can be added. hey, I need some ideas for kid friendly bites for my daughters 5th birthday party.its a pizza party .need some ideas to add to the menu. You have a perfect roti there and.... a gas stove!!! I was just going through your site and came across your pic of roti..n r'mbered seeing it in another blog.. Guess someone has stolen your pic..